The Katahdin Paper Co. mill in East Millinocket, as seen in this April 28, 2009 file photo. 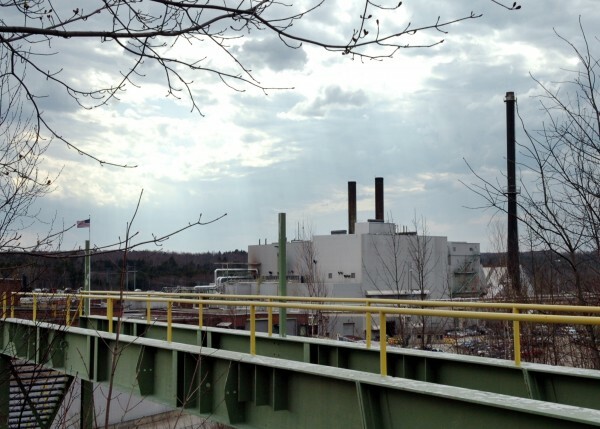 EAST MILLINOCKET, Maine — High production costs and plummeting market prices have forced Great Northern Paper Co. LLC to halt production at its Main Street mill for as many as 16 weeks as the company creates a new business plan. The temporary shutdown commenced when the afternoon shift finished Thursday, GNP spokesman Scott Tranchemontagne said. The company’s 256 workers will stay on for at least two months working toward improving operating efficiencies, including improving the mill’s water and energy use. “Stopping production was an extremely difficult decision to make, but continuing to run the mill under the current conditions is neither a viable nor responsible option. We need to fix fundamental, long-term issues, as opposed to applying short-term fixes,” Tranchemontagne said in a prepared statement. Tranchemontagne said it was impossible to predict, with the business plan not yet completed, whether workers would be laid off once the two-month period ends. Company leaders are consulting with advisers to determine whether they would need to file a 60-day notice of pending or possible layoffs to workers under federal law, he said. They “have not made any determination at this time. There are many variables to consider,” he said. The company, which had fallen behind on its payments to vendors, also will work toward paying its suppliers, Tranchemontagne said. East Millinocket and Millinocket are owed the company’s first-half tax payments for the 2013-14 fiscal year, with second-half bills due next month, officials from both towns said. Tranchemontagne said he was unaware of the company’s tax situation. The company owes Millinocket in excess of $2.3 million in taxes on its properties in that town, which include a Katahdin Avenue industrial park and a paper machine on site, Millinocket Town Manager Peggy Daigle said. Much of that gets refunded under tax deals the company has with the town and state. East Millinocket is paid about $700,000 in property taxes annually. As part of the restructuring, the company will discontinue plans to convert its heating system at the East Millinocket mill to natural gas, saying that natural gas prices were too unstable. The company makes paper for newspapers, fliers, inserts, manuals, catalogs, directories and paperback novels. Gov. Paul LePage’s administration reacted swiftly to the news. “The LePage Administration looks forward to GNP’s success in the long term and will work with them to put them in that position,” spokeswoman Adrienne Bennett said in a statement. “A major economic factor for business success is the cost of electricity. Maine companies will continue to identify creative ways to save money as a result of high electricity rates. For years, Gov. LePage has advocated for lower electricity costs for all Mainers, and he will continue to work on lowering prices to reduce the financial burden on companies like GNP,” she added. Duane Lugdon, a United Steelworkers union representative for workers at the state’s paper mills, said he could not fault GNP or its parent company, Cate Street Capital of New Hampshire, for the production stoppage. The stoppage, Lugdon said, might send a message to the mill’s electricity and wood suppliers. “Wood supply is tough all over the state of Maine. We have had a tough time getting wood out of the forest all winter, and obviously [high wood prices] makes it difficult to be competitive,” Lugdon said. “They intend to restart the mill again when those costs come down. “I cannot fault the management here. They are working in a very competitive industry. There are times when any of our mills will take production outages depending on their costs,” he added. Tranchemontagne expressed gratitude for the support Cate Street has received since restarting the mill as the new GNP in October 2011. Cate Street’s other Katahdin Region subsidiary, Thermogen Industries LLC, is awaiting a $25 million loan guarantee from the state Finance Authority of Maine, which would allow it to build New England’s first torrefied wood machine, employing as many as 36 people directly and as many as 184 indirectly. If successful, the enterprise could attract as many as 1,500 new jobs to the state, according to its supporters. Thermogen is seen as a key component to the paper mill’s success, as it uses wood wastes from trees — the green stems and small green branches — to make torrefied wood pellets, complementing the paper mill’s need for wood to make pulp that is crucial to the papermaking process. Tranchemontagne had said when FAME approved the loan on Oct. 17 that the company hoped by Jan. 1 to complete is financing to build the first pellet machine in Millinocket. Machine construction will likely start in the spring, with the machine coming online late this fall or early next year, he said Thursday.